The Lemosho route is viewed by many as one of the prettiest route on Kilimanjaro. The beauty of ecosystem is unbelievable. Begin trekking in the thick, fertile rainforest until we reach the wildflowers and shrubs. You will cross one of most beautiful areas on Kilimanjaro, the vast Shira Plateau, as you approach for the west before traversing the mountain along the southern circuit. This route is ideal those with previous backpacking experience. Arrive Kilimanjaro International Airport (JRO). A private transfer awaits you from Kilimanjaro International Airport (JRO) to Arusha at a hotel that suits your budge where you will spend the rest of the day at leisure. The mountain guide will come at the agreed time at the hotel for a pre-climb briefing and an equipment check. We recommend that this is done on the eve of the climb. The guides will assist in completing the necessary registration formalities at Londorossi National Park gate and you will then drive through varied farmland with open views over the plains to reach the Lemosho road head. Please note that the last section of the road is of poor quality and difficult to drive especially after rain and sometimes its best to start walking a kilometre or two to reach the road head. You will have your lunch at the road head before starting to walk. You will walk at a moderate pace through the beautiful lush forest to reach Lemosho Big Tree Camp where you will camp. After breakfast proceed to the moorland zone of giant heather leaving the forest behind. The trail climbs steadily with wide views to reach the rim of the Shira Plateau. You will love the wilderness here amidst the afternoon mists. Camping on this day is in the centre of the plateau at Shira One. After an early breakfast, walk to the summit of Shira Cathedral before reaching the next camp – Shira Hut. 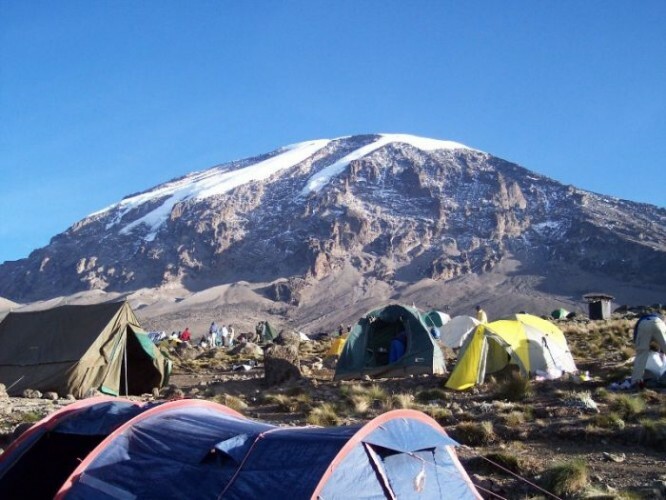 Enjoy the stunning views at this camp, close to the glaciated dome of Kibo and the jagged rim of Shira Plateau. You will also get some stunning views of Mt. Meru floating on the clouds from here – seeing is believing! Experience a morning of gentle ascent and enjoy some panoramic views, leaving the moorland plateau behind to walk on lava ridges beneath the glaciers of the Western Breach. Break for lunch around the Lava Tower junction (4,550 m) & descend to the bottom of the Great Barranco valley sheltered by towering cliffs. You will get to enjoy some magnificent views of the plains far below near the Barranco valley where you will camp for the night. This morning you will experience a steep climb up the Barranco Wall that will lead you to an undulating trail on the south-eastern flank of Kibo, with superb vistas of the Southern Ice fields. The terrain changes to scree, with pockets of vegetation in sheltered hollow, leaving you with a short distance to Karanga Camp at Karanga (4,000 m), this is the last water point on the way to the summit. This morning after breakfast, go along an easy path on compacted scree with wide views that gains altitude unrelentingly to reach the Barafu campsite (4,600 m) for lunch. You will experience a short acclimatisation walk to the plateau at the bottom of the South-East valley (4,800 m). Spend the rest of this day resting at Barafu in readiness for the final ascent the next day. An early night here is highly recommended. Start ascending by torchlight at around 1 a.m. to be able to be up on the Crater rim by sunrise. The climb is steep over loose volcanic scree and has some well-graded zig-zags. A slow but steady pace will take you to Stella Point (5,735 m), in about five or six hours. Here you could have some rest and enjoy the sunrise over Mawenzi. For those of you who will be feeling energetic, can make the two hour round trip from here along the crater rim to Uhuru Peak (5,896 m). Some strong glaciers and ice cliffs are common around this summit area. The descend to Barafu is fast, you can enjoy some refreshment & proceed with the descent to reach Mweka forest camp. Walk down the lovely forest enjoying the lush undergrowth that will take you to Mweka National Park gate. Our vehicle will be awaiting you and will transfer you to the hotel in Arusha.